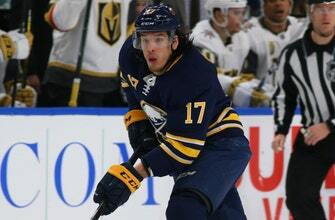 ST. LOUIS — The St. Louis Blues acquired another former Buffalo Sabres forward Thursday, signing Jordan Nolan to a one-year, two-way contract. The Nolan signing follows the acquisition of center Ryan O’Reilly in a big trade with Buffalo on Sunday. Unlike O’Reilly, however, Nolan figures to spend time at the Blues’ AHL affiliate in San Antonio. Nolan, 29, posted eight points (four goals, four assists) and 69 penalty minutes in 69 regular-season games with the Sabres last season, his first in Buffalo. The 6-foot-3, 219-pound Ontario native has 50 points (24 goals, 26 assists) and 333 penalty minutes in 361 career regular-season games with Buffalo and the Los Angeles Kings, who made him a seventh-round draft pick in 2009.